18-year-old Mahin Atif Khan has pleaded guilty on charges of inciting or inducing terrorism. 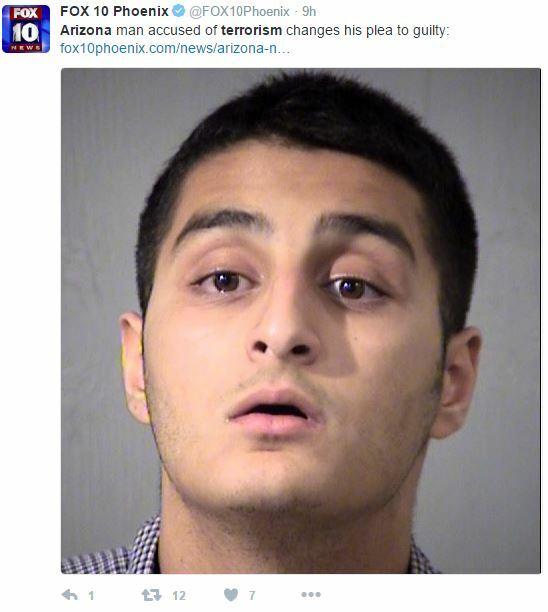 Khan planned to carry out jihad-style lone-wolf attacks in Maricopa and Pima counties in the state of Arizona. He pleaded guilty to three felony charges including inducing terrorism, financing or managing terrorism, and manufacturing, possessing, or selling prohibited weapons. Despite the severity of his charges and the this being the first conspiracy to commit terrorism to be prosecuted by the Arizona Attorney General’s Office the courts have already agreed to release Kahn on supervised probation after he is released from prison. He will be prevented from traveling outside of Maricopa or Pima counties, the two areas he planned to attack. He has also been denied bail and is being held for fear he may try to flee to Syria or Pakistan. Kahn’s plans to carry out an attack were discovered through an FBI sting. Khan communicated with FBI agents for several months while planning and discussing his attack. His three main targets would have been a Jewish Community Center, the Motor Vehicle Division office, and an Air Force recruitment center. Khan faces up to 14 years in prison and a minimum sentence of at least five years. He will be sentenced on November 4, 2016.